Here's my "Eventide" pullover, one of my comfy favorites. In the spirit of fun, this one was made as a roomy, over-sized raglan sweater. Every woman needs at least one, tho I prefer multiples. 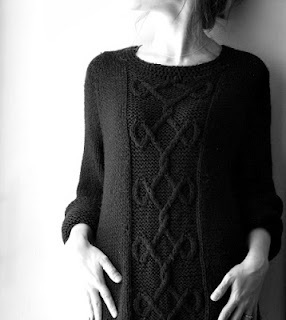 This number highlights my favorite, the Aran. You'll likely see this panel or it's variations incorporated again, as I've used them in a few of my unreleased designs already. Embracing looser fitting garments lately, this is one of my go to cozy tops. (Seems I have a lot more of those the older I get, hehe.) I love wearing this with the sleeves rolled up to give the illusion of 3/4 sleeves with bulky cuffs. In hindsight, I could've double stranded the sleeve ends & knit them in reverse stockinette in lieu of long, but this way leaves me with the option to unroll on a chilly eve. The size 10 needles give this good old workhorse Caron SS an airy look that has good drape and wears well in most seasons! I was eager to use what I had a lot of on hand at the time. No waste! I threw in some crochet trim for the neckline & simple eyelets line the bottom edge and wristbands when unrolled. Little additions polish up a piece beautifully! I've said it before - knit & crochet pair well in my opinion. When it comes to making something for me only, (not my published designs), I don't always like sticking to textbook rules of do this/don't do this when it comes to needles size & yarn selection. Adventures in knitting! It's quite educational to look at a finished piece and implement things that I wish I'd done into my new designs. Don't misconstrue what I'm saying...formula is crucial for garment design. I generally don't like inhibiting creativity with suggested needles sizes and such...they're just that, suggestions. Swatching shows how the same stitch worked in different gauges can take on an entirely different feel. If it works, I run with it. Call it "yarnarchy." Hehe. This one was freeplay knitting just for me. Showing some love for my talented Pop! Enjoy! 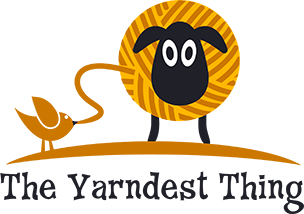 Copyright © 2010-2018 The Yarndest Thing. All Rights Reserved. Simple theme. Powered by Blogger.